Still heading south, this time to Steinhagen Lake. Sandy Creek COE has a larger number of sites and good online reviews. 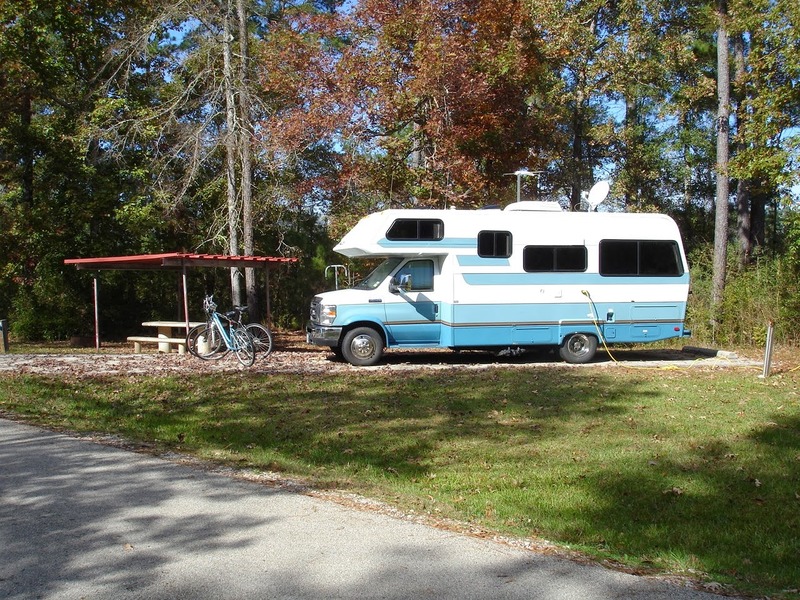 We are a bit concerned because we are coming into Thanksgiving weekend and once you enter this area south, that means a big family camping weekend. To add to the congestion, this is also a school vacation week. But , we are lucky. 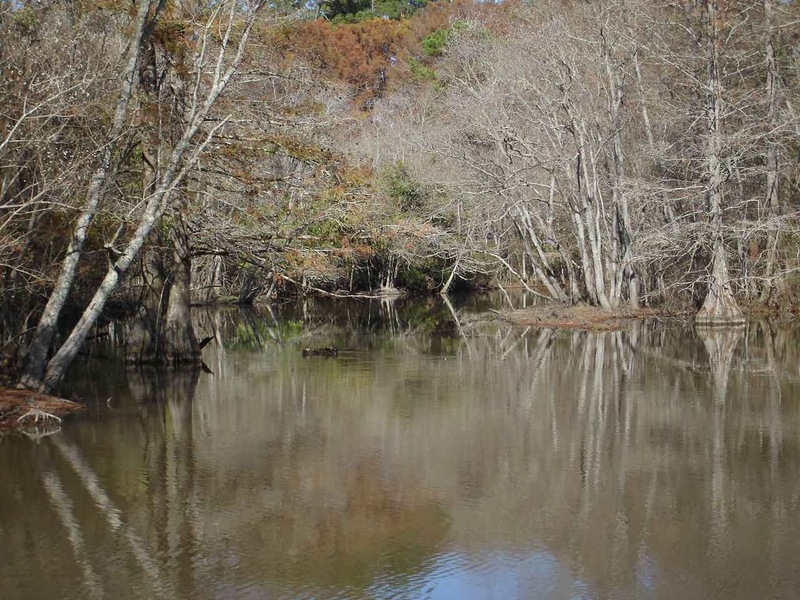 There are three sites available and Site # 17 is a good choice. Luckily, there was a cancellation and this is a great , private site. In case you were wondering, our backup plan was to go to Livingston, our home base, about 50 miles west. 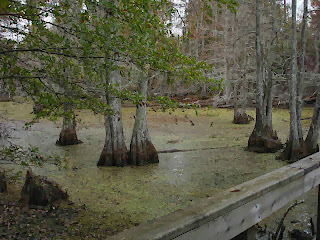 A number of picturesque cypress trees help the image. 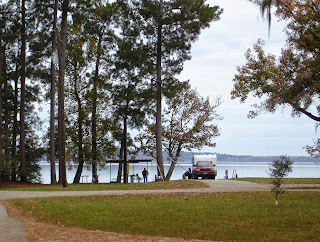 This is another popular fishing lake and the families young to older are enjoying the water. 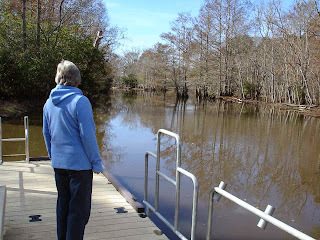 A bit of a challenge for some since the weather turned very cold(daytime in the 40's) after inches of heavy rain and flooding ----the same storm some of you saw up north. Steinhagen Lake is quite large and open, but there still are small creeks all around . Jan and I are impressed by the families here. Many young children enjoying the playground and bikes. But they are very well behaved and quiet. The campers are all very considerate and even with large Thanksgiving meals still keep a clean and organized site. 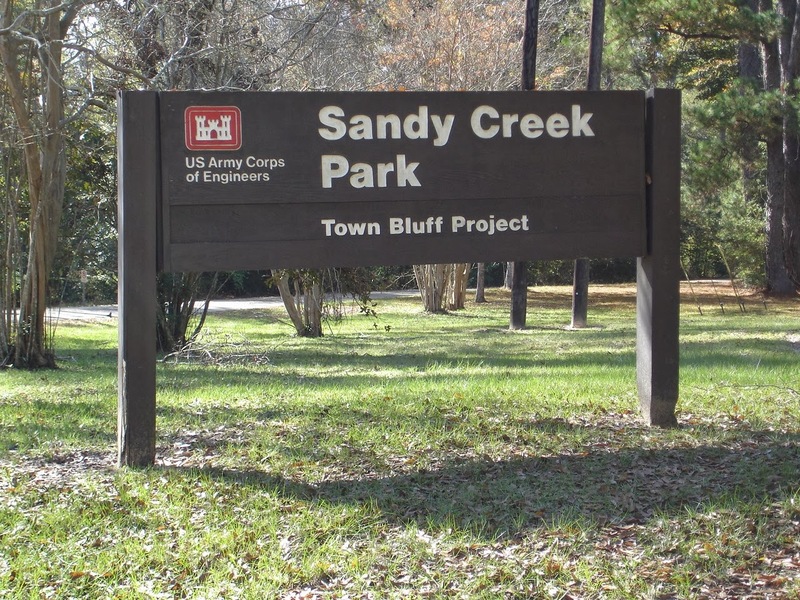 Sandy Creek has been added to our list of favorites. Not only because of its $9 per night, but also for large, private sites and miles of biking and hiking. 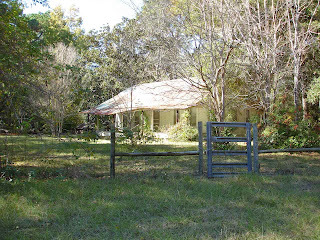 Along our way to the other campground at Sandy Creek we see this abandoned house, tin roof and all. Looks like a real fixer upper. No "for sale" sign though, just "private property" signs. 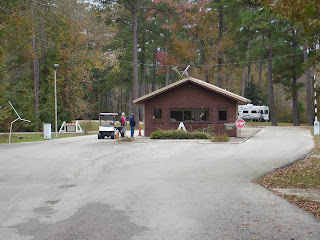 A typical entrance booth to a COE park. The hosts were very friendly. Some are here for months. They usually split time with another couple. They man the office for 4 days on and 4 days off. For that work, they bid to the Corps and if they win the bid, they get a free site and hourly pay. Good retirement jobs for those who want a little extra income and they often move around the country. There are a number of sites like this water view. But, you should plan to reserve them. They might, however, be available during the winter during the week. Some beautiful views along the campground. Often, we see campers sitting out at their fireplaces and watching the lake. A couple at this campsite over the holiday were doing just that..
After the weekend, it is a very short 15 minute trip to the state park. 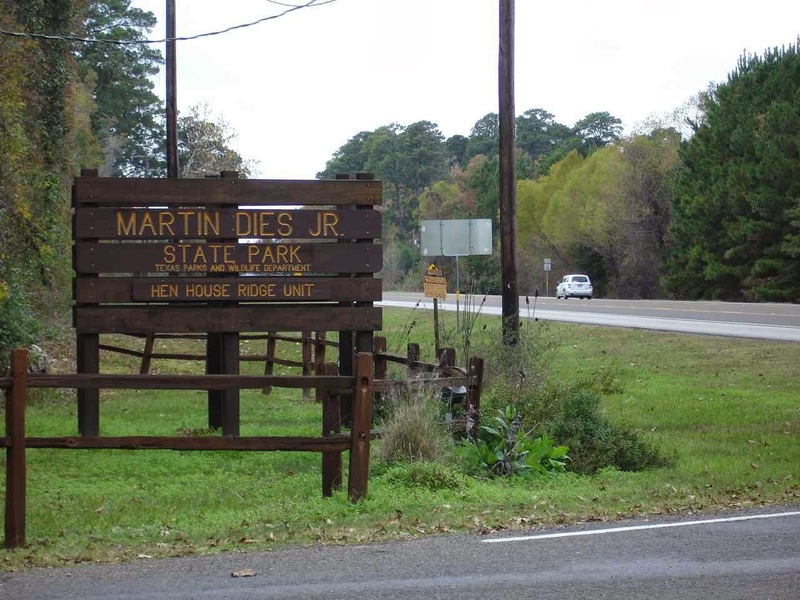 We need to get more information about Texas parks. We know we will run out of COE parks as we head further south. Jan and I are impressed with Martin Dies Park. It is a large and well kept park. There are large, private, and flat sites. This is a swamp off a nature trail--one of many --through a section of the park. 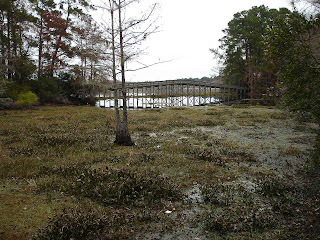 This island walk uses wooden walkways and a wooden bridge. We actually rode for hours on our bikes, just around sections of the state park. Good roads and good trails. Let's see. How do you know when you are down south? 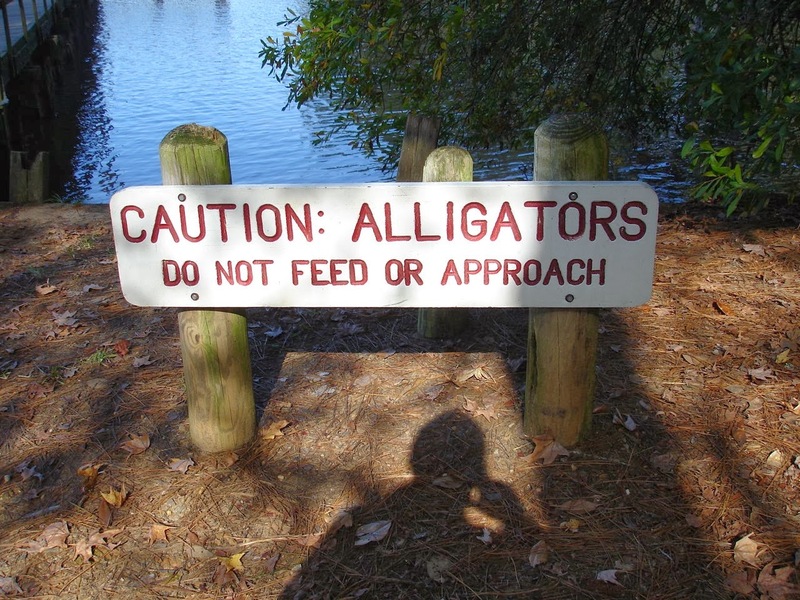 Maybe when you see these gator signs. 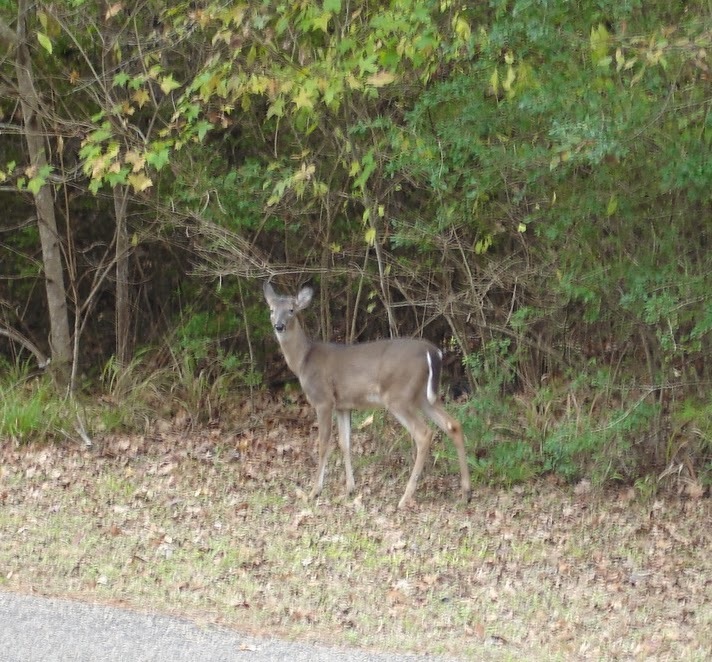 One site over is a gathering spot for a herd of deer--about 20 or so. 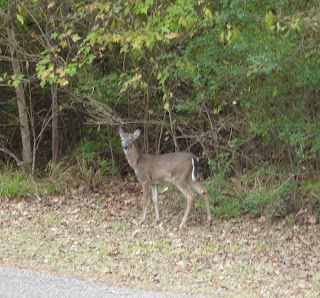 Maybe they realize there is no hunting in the park. 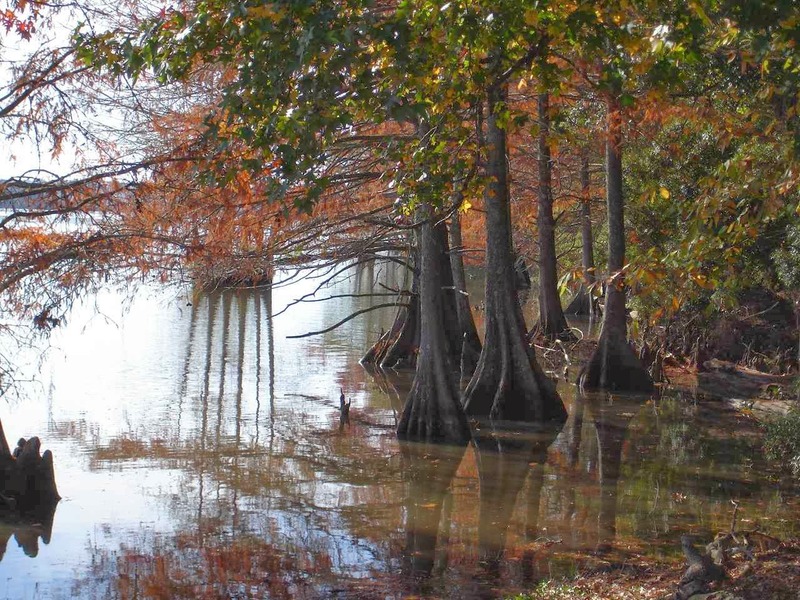 Texas, like Georgia and other southern parks, likes to take care of the fishermen. 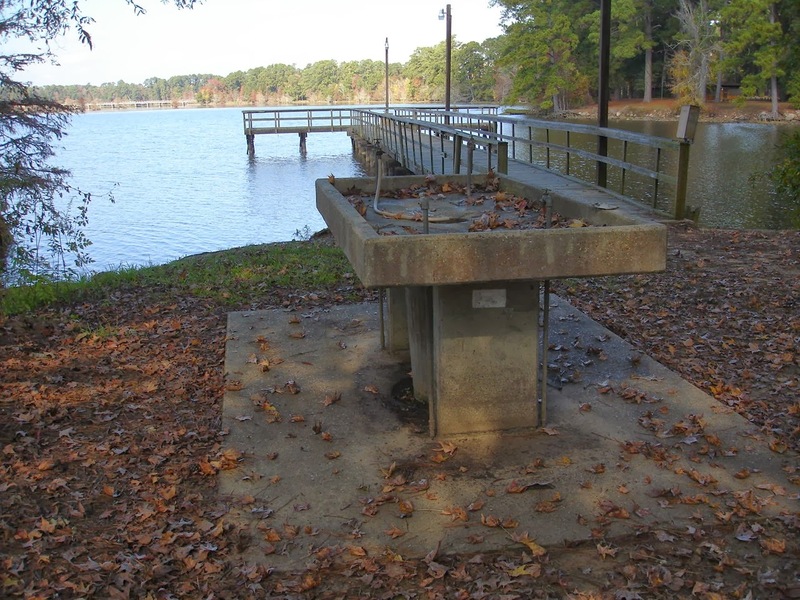 They build a number of boat ramps, fishing wharfs, and fish cleaning stations. This station is basic , but it serves the purpose. 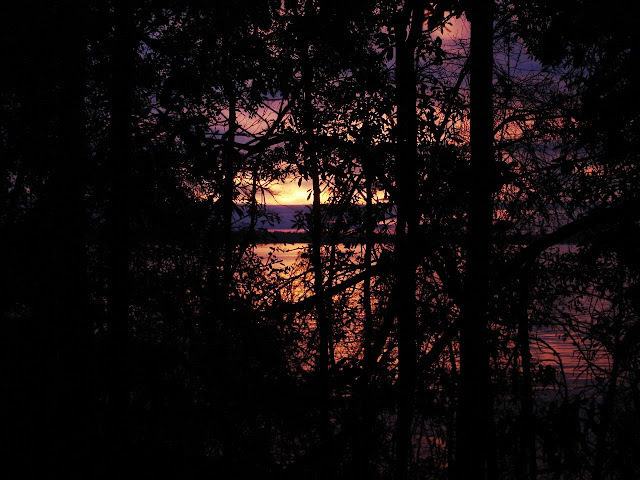 This is the view from our site at sunset. We were going to stay for just one night, but-----we made it two. Thanks for sharing. 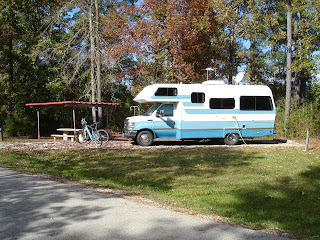 After our month long stay at a RV Park in Rockport TX in Jan, we decided to meander around the state for the month of February. Always good to know where the nice spots are and water is always a bonus.